Wine + Market is a boutique deli, market, wine, craft beer and specialty liquor shop located in historic downtown Lexington. The market offers a large variety of domestic and imported cheeses, charcuterie, deli meats and seasonal locally grown produce. We have daily baked fresh bread and pastries, complimented by a full coffee menu that features organic, locally roasted coffee. Lunch is served daily from a menu that features gourmet sandwiches, soups and salads. For parties or corporate functions, Wine + Market offers take away platters for sandwiches, cheese and charcuterie. A 48 hour notice is required. Our beautiful wine room offers a hand-picked selection of quality wine, spirits and craft beer from around the globe. We also feature several Kentucky craft Bourbons and have an assortment of organic wines. Because quality products are integral to Wine + Market, we typically feature products from smaller boutique producers whose carefully crafted goods offer remarkable value. Wine + Market features Friday night wine tastings, monthly wine classes, a Wine of the Month Club and frequent specialty tastings. Our kitchen closes at 7pm Monday – Saturday and at 5pm Sunday. Their wine tasting events are led by one of the owners who is also a certified Sommelier. I had the duck confit sandwich, and it's plainly one of the best sandwiches I've ever tasted. The owners are there everyday and offer their expert advice on which wine and accompaniments to buy. Wine + Market and Enoteca owner and Lexington native Renée Saunier Brewer has worked extensively in the wine industry for several years. Renée graduated from the University of Kentucky where she studied Agricultural Economics and French, and was also involved in Kentucky wine industry marketing research. After graduating, Renée worked briefly at Kentucky winery Equus Run Vineyards (where she met her husband, Seth) before moving to Paris to begin an intensive masters course in international wine marketing and management with an inter-governmental organization called the O.I.V. Through this program Renée travelled to the world’s leading and emerging wine markets to study their industry structure by visiting private and public industry businesses and taking specialized wine courses in finance, marketing, law, viticulture, enology and sensorial analysis. To complete her OIV practicum, Renée moved to California to work a harvest at the Napa winery Blankiet under acclaimed winemaker Helen Turley. At the end of the harvest season Renée took a job at wine marketing firm Balzac. In 2006 Renée moved back home to Kentucky and worked for boutique wine distribution company Bacchus Wine & Spirits as a central Kentucky sales manager for several years before working at Wine + Market. On November 1st 2011, Renée purchased Wine + Market and has developed the wine program offering a great value boutique wine selection, wine club of the month, hosts private wine events and teaches wine classes. 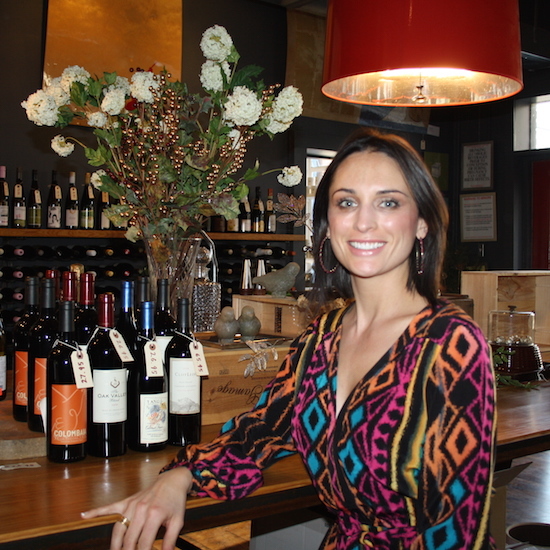 In July of 2013, Renée and Seth opened Enoteca – a wine and tapas bar. The carefully curated beverage list features wines from around the world, as well as craft beers and an extensive bourbon selection. Both business are on the corner of Jefferson and Second Streets in downtown Lexington. Renée is also a Certified Sommelier (CS) and a Certified Specialist of Wine (CSW).